Damascus is most striking in its slow pace and dignity. Despite its population of nearly 2 million, there is none of the chaos of Cairo or the sprawl of Amman. Unlike other Arab capitals, this city conveys a sense of permanence and pride. That atmosphere is crucial in understanding the forces at work in Syria today. When 35-year-old Bashar Assad assumed the presidency this summer after his father's death in June, Syrians held their collective breath. After taking power in a quiet 1970 coup, Hafez Assad had led Syria through 30 years of stability--sometimes ruthlessly, always with slow calculation. On the streets of Damascus. 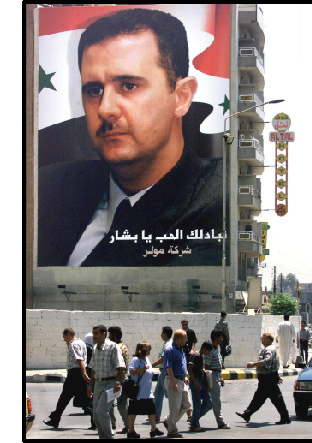 Bashar Assad has been a more modest leader, not encouraging as many of the billboard-sized portraits and fawning children's songs that were a trademark of his father's administration. Practically, his reforms have touched everything from the economy to freedom of expression to Syria's relationship with the outside world. Arguably the greatest challenge facing Syria today is the alleviation of poverty and the state's introduction to the world economy. Syrians say they support the slow moves toward economic privatization and government deregulation, but point to the dire straits of the ex Soviet bloc as reason to go slowly. The country's per capita annual income is currently less that $1,000, as compared with Israel's $17,500. An estimated unemployment rate of 25 percent remains cloaked in government overhiring. The public sector, including 400,000 soldiers and 200,000 in internal security, is the largest employer, with 40 percent of the national budget going to those two sectors alone. For the average Syrian, the lack of economic growth stalls the normal flow of Arab life. Even middle-class employees who take home $100 a month cannot afford to rent an apartment in Damascus. Land is expensive and scarce, and as such, young people put off getting married in hopes that windfall will bring them the means to provide a comfortable life. Under Bashar Assad, however, moves to free up the economy, as well as rein in government corruption, seem to have begun in earnest. A new law allows Syrians who have studied abroad and then stayed outside the country to avoid mandatory conscription to return home by paying a fee of several thousand dollars. The move is intended to bring Syrian professionals home to invest the wealth they have earned abroad. Other legislation has opened the door to auto imports that have been restricted since the '60s--provided, of course, that buyers pay a steep import tax. And the government is also loosening its hold on information capital. Satellite hook-ups have been available for five years, making state television obsolete. Assad has made an early commitment to adding nearly 200,000 Internet lines. In September, home lines became available to those with the proper government contacts, and while some e-mail portals are blocked by the state, Internet cafŽs provide complete access to those who Yahoo! These economic reforms have come hand in hand with a shifting political climate. Not only were 99 intellectuals able to issue a statement in Damascus earlier this year calling on the government to release its estimated 1,500 political prisoners, but in mid-November Assad actually freed 600 of those jailed. Additional amnesty was given on November 22 to thousands of convicted deserters and smugglers. While these bold strokes may appear to be those of a son eclipsing his father, it is clear that Bashar is still growing into his pivotal role. Surrounded by his father's longtime advisers, the younger Assad continues to move cautiously and with their council. He knows that the greatest challenges are yet to come--from outside and perhaps from home.